Secret menus are a huge trend in fast food right now. Some of them are simply menu hacks that clever customers have figured out and shared, while others are actually official secret menu items that restaurants are testing out in certain markets before putting them on their regular menus. Wendy’s is no exception to the rule, and you might be surprised how many items you can find on the Wendy’s secret menu for delicious alternatives to regular menu items that don’t cost a lot and can leave you feeling totally satisfied. 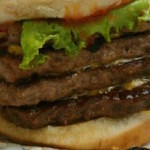 While some other restaurants might have longer lists of secret menu items, the Wendy’s secret menu is short and sweet, consisting of two items that you’ll definitely want to try – the Barnyard Burger and the Meat Cube. The Barnyard Burger is a pile of chicken, beef, and bacon on a hamburger bun with lettuce, tomato, and cheese. In other words, they took all of the farm animals that they serve on their normal menu, and they piled them up high on a single sandwich for a whole barnyard in every bite. This is probably the most popular of the Wendy’s secret menu items, as it’s incredibly delicious and very filling. The Meat Cube is also sometimes called the Grand Slam, so you may want to ask for that if your cashier doesn’t recognize it. However, remember that these are secret menu items and that not all Wendy’s locations will be authorized or prepared to serve them. So always be polite, and if you can’t get anything from the secret menu, go ahead and order your favorite item or combo off of the regular menu. Have you ever ordered from the secret menu at Wendy’s? What was your experience like? Were you able to finish a whole Meat Cube, or did you need help? Check out our Wendy’s menu prices for the secret menu below, but remember that prices and availability may both vary.